We mentioned some switch-ups on the blog and here's the first one: welcoming Meredith as a twice a week contributor! Meredith spends a lot of her time at Modern Domestic, but you may have met her behind the counter at Bolt on Sundays. She is a fantastic sewist, not to mention an all-round good person to have around. She and Gina (the big boss and the new writer for Wednesdays) will be replacing me and my typos, while I'll pop in every so often with a Weekend Project. Hey Meredith, I have a couple of questions! Where did you spend your time before you started spending all of it at MD and Bolt? I spent it in NYC! My husband and I moved to Portland from Brooklyn last summer. For a chunk of my 5 years in NY I was pursuing a career in costume design. So when I got burnt out, I got a full-time job at the City Quilter. I was the manager there when we moved. I love fabric. LOVE. It's a great weakness of mine. 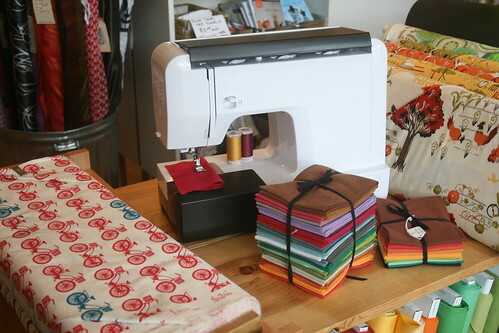 What do you think the most under rated piece of sewing advice is? Press every seam you sew. It's always so apparent when you don't and by doing so can really take your work to the next level. Definitely not a shortcut to take. Why do you think Bolt is so great? The ladies who work there. The fabric selection. The trims and printed bias by the yard. And it's right next to Pine State Biscuits. Ha! I hardly think I'm awesome. I love to sew. I love to teach. I love that I get to work with and talk about fabric every day. Hey Melissa, where are you going to spend all your time now that you're not hanging around Bolt wasting all of it? More laundry, probably. I'm actually hoping to spend a little more time developing some projects I've had going on the side. We'll see though-- it might just mean that I start keeping up with my three boys, rather than running two steps behind them. You stole mine! I think reading and following the instructions on a pattern if you're making it for the first time. I've been tempted to skip this step opting to figure out for myself, and nearly always regretted it. It's been wonderful to watch it grow so quickly. 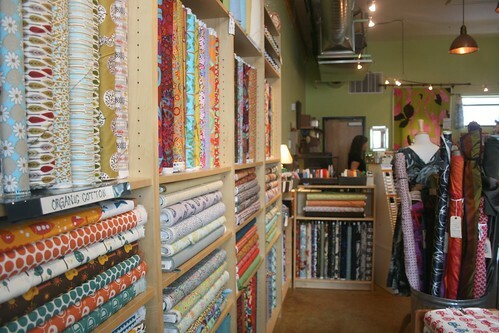 Gina has created a remarkable space filled with a quality and breadth of fabric that is really fantastic. A steady diet of breakfast cereal and burritos. Wait. What was the question? Meredith will be introducing new features and I'm selfishly VERY excited to benefit from her extensive apparel sewing expertise!